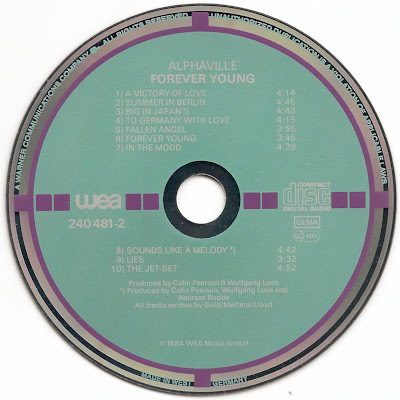 In this post a less common variation of Alphaville's Forever Young, with MADE IN WEST !! GERMANY at the bottom of the disc, is presented. As is usual the case with this type of variation, MADE IN W. GERMANY BY PDO is etched around the center hole on the playside of the disc. On the back insert it says that the disc was Made in Germany by Record Service GmbH, Alsdorf.